This is a midtown Memphis neighborhood that’s great for running. Our route combines a 1.7 mile abandoned railway which is now a bike path, pleasant residential streets, and the Vollintine Hills Historic District, notable for its cohesive collection of 78 post-World War II Minimal Traditional and ranch-style houses built around a former synagogue (now the Gethsemane Garden Church). The V&E Greenline starts at the corner of N. Watkins St. and North Parkway and runs for 1.7 miles behind some lovely Memphis homes. It’s a good shade option on a hot day. At the eastern terminus of the trail, take Vollintine Ave., and do a tour of the streets around the Church — see our map. It’s also fun to do a DIY tour of some of the pleasant side streets south of Vollintine. It’s a good neighborhood for running, with sidewalks and set back homes. Just south of the eastern terminus of the trail, Fargason Fields has a historical marker and a running track. 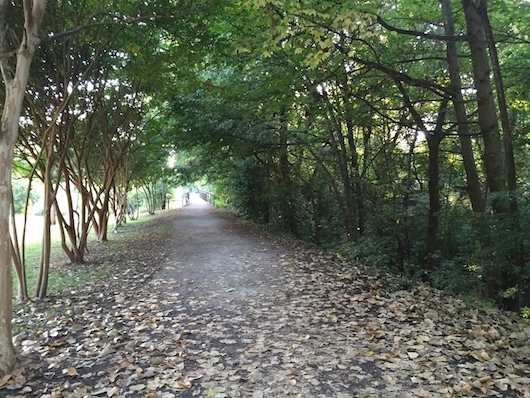 Add-On: Running track in Fargason Fields, just south of the eastern terminus of the V&E Trail, and Overton Park, which has a 1.4 mile designated running loop.